This page contains some games to help your young player improve their skills or just have some fun. A good drill to improve a player's bunting skills. The drill may be turned into a intrateam competition or simply played between parent and player. A yard, ball field, or park will do! If playing as a intrateam drill, divide the team into two squads. A fun and competitive game well suited for a team drill. The game helps develop quick hands and simulates situations where a cut-off relay is required to move the ball quickly from the outfield to one of the infield bases. Minimum of three players per relay "team" with four as the optimal size. Larger teams of up to six players are also possible. Divide your players into even sized teams of 3-6 players each. Line up the teams so that they are parallel to each other. Have all teams start play on the same end and designate that player as the "starter". The starter throws the ball to the next player in line to start the relay. Each player in line throws the ball to the next player in line. The last player in line reverses the relay and the players move the ball back to the starter. The team that can most quickly round trip the ball back to the starter wins. An old game that some of you may remember. This game combines basic fielding and batting skills. This game is best played with about 5 players and is also a good game for a parent to join. Minimum of 3 players, but you may have as many as 7. A yard or a local park will do! Select one player to start as the batter, the rest of the players are fielders. Fielders line up in a straight line facing the batter and spaced about 5' - 8' apart. The line of fielders should be 15' - 30' away from the batter depending on the skill of the players. Starting from the batter's left, the first fielder pitches the ball to the batter. The batter hits the ball to a random player either as a grounder or line drive. Whichever fielder catches the ball then pitches the ball to the batter and the process repeats. Fielders are eliminated if they throw a bad pitch, fail to catch a line drive, or allow a grounder to get past them. The last fielder in line is the winner. The first fielder to be eliminated becomes the catcher for the batter. If the batter has sufficient skill and can deliver a pop-up then the fielders must call for the ball. A fielder is eliminated if they drop the ball or catch the ball, but fail to call for it. The batter must be careful not to swing with their full strength. The objective for the batter is to deliver the ball to a fielder and not try to bat for distance. This game goes under a few different names, but whichever name you may know these are all the same game. The game gets it's name from a play situation in which a runner is caught between two open bases such as might occur when a player attempts to "steal" a base in either baseball or softball. Minimum of 3 players, but you may have as many as 6 or more! A yard, park, or a local baseball diamond will do! Set up the two bases about 20 - 60 feet apart. 20 feet is great for a game at home, but 60 feet would simulate the regulation distance between two bases on most little league fields. Two players are selected to be a defending "baseman" with one at each base. "Runners" are selected and divided up between the two bases. The runner is "safe" as long as they remain in contact with a base. The game started is by the two "basemen" tossing the ball to each other. The object of the game is for the "runner" to traverse one base to the other (a "steal") without being tagged by either "baseman". A "runner" tagged by the ball trades places with the tagging "baseman" and is now a "baseman" themselves. The game is played for fun. Players can keep "score" by the number of bases stolen without being tagged. The runner may only be tagged by the baseman holding the ball in his glove or throwing hand. 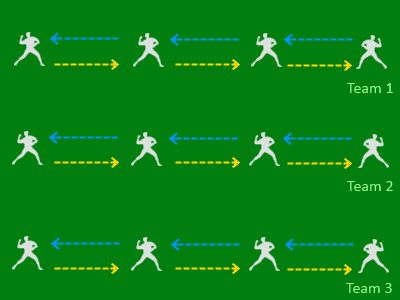 The runner must travel in a straight line between the two bases. The runner may not over run the bases. The basemen may not stand in the baseline such as to block a runner unless the baseman has possession of the ball. Runners should keep contact with the base if not actively trying to steal a base. If there are too many runners to stand on the base all at once, then they may line up behind the base and are "safe" as long as they remain behind the base. Sliding to a base is at the discretion of the parent or coach, but should only be allowed if the players have been instructed on proper technique. When in the position of the baseman, the player should try to keep the ball in their throwing hand. This allows the player to react quickly if needing to throw the ball to their partner, but still allowing the ability to tag the runner out. 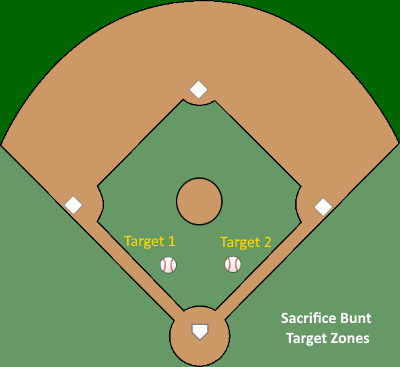 The baseman are allowed to "close" the distance between the bases. Often this is best done in tandem with the other baseman and forces the runner into a smaller area to run. If done correctly the basemen will box the runner directly in the middle of the two bases with no place to go and easily tagged. The basemen are allowed to communicate to each other. In a game situation the two defending basemen may communicate to each other and coordinate their efforts. Securing the ball for the tag is best done by keeping the ball in the throwing had, but wrapping the glove around the ball and hand. This helps prevent the ball from being accidently dropped. This is a good activity for a younger player and parent, Tee Ball team, or a Single A team looking to build some confidence or just to have fun. Players at these younger levels will often have trouble hitting the ball beyond the pitcher's mound much less the infield skirt. Use the activity to encourage proper batting stance, develop a good swing, and build some strength. Initially set cones or other markers in an arc approximately 30' - 40' from home plate. For the Single A players this would be just a few feet short of the pitcher's rubber on a softball field or short field. Tee Ball players should start with the markers set just in front of the pitcher's circle on a softball field or short field. Each player takes a turn at bat and has three chances to hit the ball. If the player is able to hit the ball into the infield and passes the markers then they have a home run. As the players improve, move the cones progressively further back in 5' - 10' increments. If playing on a short field or softball field then let the outfield grass skirt be the final marker. If there are enough players then place them in the field just behind the markers. As balls are hit let the players field the balls that pass the home run markers and have them throw to one of the bases to simulate making a play.